Few "Revisionist" filth merchants invest as much work into their propagandistic falsehoods as Thomas Kues (TK). In his obsessive endeavor to provide «Evidence for the Presence of "Gassed" Jews in the Occupied Eastern Territories», the new "Revisionist" coryphée has produced two articles with a total of more than 42,000 words including footnotes, the "To be continued" at the end of the second article suggesting that there will be at least one further installment. This huge amount of text, which is obviously the result of much painstaking (and inevitably selective) research, is less impressive than its quantity suggests, insofar as much of it are quotes of contemporary press articles or eyewitness accounts mentioning Jews that, according to what TK calls "mainstream historiography" (as opposed to "Revisionist" propaganda, which is supposed to be some form of alternative historiography), shouldn’t have been where these sources claim they were, in the Nazi-occupied territories of the Soviet Union. TK is especially interested in Jews from Western Europe (France, Belgium, the Netherlands, Luxembourg), because he reckons that, as almost all Jews from these countries are held by "mainstream historiography" to have ended up at one or another of the camps on Polish soil exclusively or also dedicated to systematic mass extermination (Chełmno, Bełżec, Sobibór, Treblinka, Auschwitz-Birkenau and Lublin-Majdanek), "any reliable report of Dutch, Belgian or French being present in the occupied eastern territories from the spring and summer of 1942 onward (and up until May 1944 in the case of the French Jews) is to be regarded as strong evidence" in favor of the "revisionist transit camp hypothesis", i.e. the nonsensical claim, at odds with all known evidence, that the mentioned extermination camps were actually transit stations through which Jewish deportees were sent to places of resettlement in the Nazi-occupied Soviet territories. Of course this is hardly a logical proposition considering, besides the direct eyewitness, documentary and physical evidence to systematic mass murder at these camps, the number of documented deportees from Western Europe, the documentary evidence that allows for tracing their journey to these camps, and the absence of both documentary evidence and testimonies from returnees to either of these countries that might suggest an onward journey from these camps. Given this overwhelming evidence to the contrary of TK’s proposition (which also includes a much higher number of witnesses at the theoretical destinations who did not mention any "anomalous" Jews there), accounts of isolated witnesses who thought they saw or heard about French, Belgian or Dutch Jews in the occupied Soviet territories must be attributed to inaccurate perception or recollection on the part of such witnesses, to rumors or, in some cases, to possible propagandistic distortions of accounts. The most that TK can reasonably argue is that the claimed French, Dutch or Belgian Jews were part of the one recorded transport of French Jews to Kaunas/Kovno or got to the occupied Soviet territories in so far unknown transports of forced laborers from among the registered inmates of Auschwitz-Birkenau or Majdanek or the workers removed from transports to Auschwitz-Birkenau at Kosel - and then perished there, given the absence of known returnees from these hypothetical transports. As concerns Dutch Jews there would also be the possibility that they got to Theresienstadt in transports leaving Amsterdam on 21 April, 26 May and 14 September 1943 and were then put on transports from Theresienstadt to the occupied eastern territories. While Jews from France, the Netherlands or Belgium are his main focus, TK has also fished for mentions of Jews from other places of origin that he claims shouldn’t have been in the occupied Soviet territories according to "mainstream historiography". Where such Jews are reported to have come from regions of Nazi-occupied Poland whose inhabitants are known to have largely perished in a certain extermination camp, he postulates that such Jews must have been "transited" through that extermination camp, without considering the possibility that such Jews were refugees who had fled to the USSR from German-occupied Poland before the Nazi invasion in 1941 and notwithstanding the absence of evidence to any such stopover in transports of forced laborers to the occupied Soviet territories. These postulations are particularly amusing as concerns Jews from the Łódź ghetto supposedly "transited" via Chełmno extermination camp, considering the way the Jews from Łódź were taken to that place (railway transport to Kolo station, then narrow-gauge train to Powiercie station, three miles northwest of Chełmno, then truck from Powiercie to the manor-house camp) and the fact that Chełmno lies to the northwest of Łódź, as can be seen in the map below. Equally nonsensical, for geographical reasons already, is the claim that Jews from places in Galicia such as Lwów (Lemberg) and Kolomea were sent to the occupied Soviet territories via Bełżec. As I told TK’s associate Carlo Mattogno in a previous blog, the conclusion that any reasonable and honest person would draw from looking at a map like the one below is that deporting people to the occupied Soviet territories via Bełżec from places like Kolomea and especially Lemberg, Brody, Zloczow, Tarnopol and Skalat would have been sort of like traveling from Messina to Catania via Palermo. Visitors of beautiful Sicily may have reasons to take such a long detour. But what reasons would the Nazis have had to transport Jews to Bełżec from Lemberg, or from places as close to the Soviet border as Tarnopol and Zloczow, if their intention was to deport them to the occupied Soviet territories? These and other incoherencies in outside-the-mainstream "historiography" are not the most deplorable part of TK’s laborious effort, however. Neither is his failure to realize that, if the "transit camp theory" were more than just the wishful thinking of ideologically motivated fanatics, he wouldn’t have to go fishing for isolated references to Jews from the "wrong" places in the occupied Soviet territories, for the evidence to the deportation of about 2 million Jews to these territories would consist of at least the same amount of surviving documentation that allows for tracing these deportees to the extermination camps (but more probably a huge surviving paper trail, which the Nazis would have had every interest in preserving, as it would have been their best defense against accusations of mass murder), plus the accounts of thousands upon thousands of eyewitnesses from among the German civilian and military administration, the local populations and especially the surviving deportees themselves. The most deplorable part of TK’s "study" is the dishonesty he reveals as he applies flagrant double standards of evidence. It doesn’t help the credibility of who proclaimed a (falsely claimed) lack of "documentary as well as material proof" to be the reason why "Revisionists" don’t accept the historical record of mass extermination, if that person then tries to build the case for his "transit camp theory" mainly on accounts of witnesses (moreover such that are mostly based on hearsay and rumors as concerns the claims they are meant to support) and on contemporary press reports (one might as well try to make a case about the existence of Iraqi Weapons of Mass Destruction based on newspaper articles prior to the 2003 US invasion of Iraq). Especially if in doing so he ignores not only a huge body of eyewitness testimony but also documentary and material evidence contradicting his conjectures, and furthermore lamely dismisses as mere allegations the parts of "his" evidence that don’t fit his theories while enthusiastically embracing those that do. Baseless insinuations that "mainstream" historians are dishonest or don’t know what they are doing make TK’s performance even more miserable. Part 1 of TK’s "study" has already been commented in earlier blogs. The discussion of Part 2 will mainly focus on the territory where TK tries to place most of his "transited" Jews, the areas that were part of the Nazi Reichskommissariat Ostland. The Reichskommissariat Ostland (RKO) was one of the two areas under civilian administration in the Soviet territories occupied by Nazi Germany, the other being the Reichskommissariat Ukraine. It was headed by Reichskommissar (Reich Commissioner) Hinrich Lohse, seated in Riga, Latvia, and divided into the Generalbezirke or Generalkommissariate (General Districts) Estonia, Latvia, Lithuania and White Ruthenia (Weissruthenien), the latter covering the larger part of present-day Belarus. Each Generalkommissariat was headed by a Generalkommissar (General Commissioner) and subdivided into Gebietskommissariate (Regional Districts) headed each by a Gebietskommissar (Regional Commissioner), which are shown on the map below. The RKO had a total area of 512,000 km² and a population of 19,200,000. TK argues that large and so far unknown numbers of Jews were deported to the General Districts White Ruthenia, Lithuania and Latvia. 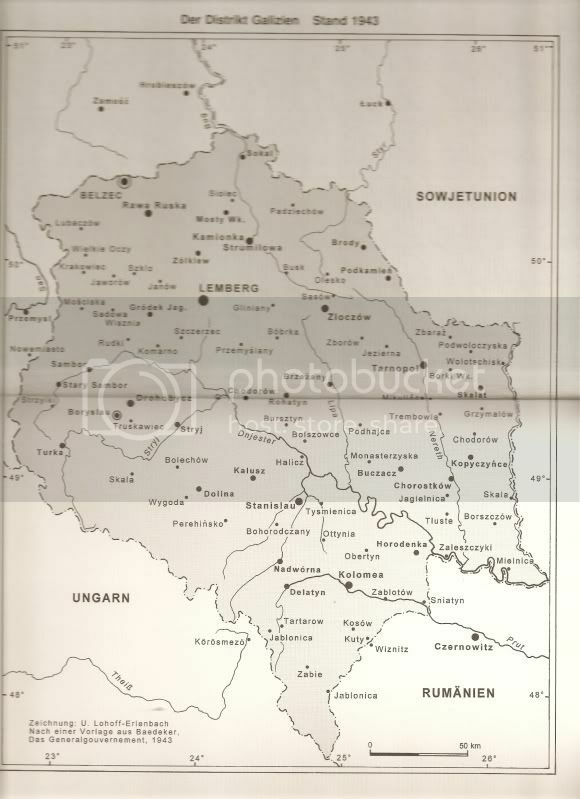 The General District White Ruthenia was divided into the Regional Districts Lida, Slonim, Nowogrodek, Glubokoje, Wileja, Baranovitschi, Hansewitze, Borissow, Minsk (city), Minsk-Land (rural area) and Sluzk. The General Commissioner was Wilhelm Kube, who was assassinated in September 1943; his successor was SS-Gruppenführer Karl von Gottberg. TK tries to place as many of his "transited" Jews as possible in the Minsk area. His motivation for doing so is not easy to understand even from a "Revisionist" point of view, for it has been ascertained on hand of a large body of evidence (which TK does nothing to refute where he addresses it at all, apart from the occasional "allegedly" when referring to a witness’s mention of mass killing, and the remark that transports are held by historian Gertrude Schneider to have ended up at Maly Trostinec despite being "listed in documents as bound for nearby Minsk") that the Jews in this area, both indigenous and deportees, were almost completely wiped out by the Nazis, largely at the Maly Trostinec killing site. Maybe it makes a difference to TK’s "Revisionism" whether people were killed in the Treblinka gas chambers or by shooting and in gas vans in the Minsk area. Or then he intends to spin something regarding the Minsk killings in his next installment. Anyway, TK proudly presents to his readers the witness Lev Saevich Lansky, an inmate of the Maly Trostinec camp from 17 January 1942 onward, who in his interrogation by a Soviet investigation commission on 1944 mentioned "ninety-nine transports of a thousand people each that came from Germany, Austria, and Czechoslovakia". That’s 71 or 72 transports too many according to TK, because there were 5 transports from Theresienstadt to Maly Trostinec between July and September 1942 and "of the 25 transports departing Vienna for Minsk in 1942, only 22 or 23 could have been diverted to Maly Trostinec". TK wonders whether it could be that «further, indirect transports» reached Maly Trostinec «via the "extermination camps"». The difference between the number of foreign transports mentioned by Lansky and the number of such transports borne out by documentary evidence is actually even higher than assumed by TK. The below list of transports to the occupied Soviet territories  shows a total of 23 transports from the Germany, Austria and Czechoslovakia to Minsk in 1941 and 1942 (7 in 1941 carrying a total of 6,937 to 7,090 deportees, who became inhabitants of a segregated section of the local ghetto, 16 transports in 1942 whose occupants were mostly killed upon arrival at Maly Trostinec) plus two additional transports with incomplete data mentioned by Gerlach, besides 5 transports to Kovno, 25 transports to Riga, two transports to Raasiku and one transport to Baranovichi, all destinations located in the RKO. Eager as all rancorous "Revisionists" to cast aspersions on the competence and/or intellectual honesty of professional historians, TK contrasts Gerlach’s «list of 18 transports to Weißruthenien that are "certain to have arrived" and 5 "uncertain" ones» with "a more comprehensive list provided by Graf and Mattogno", in which there are "a total 34 transports for the period in question (May-November 1942)". 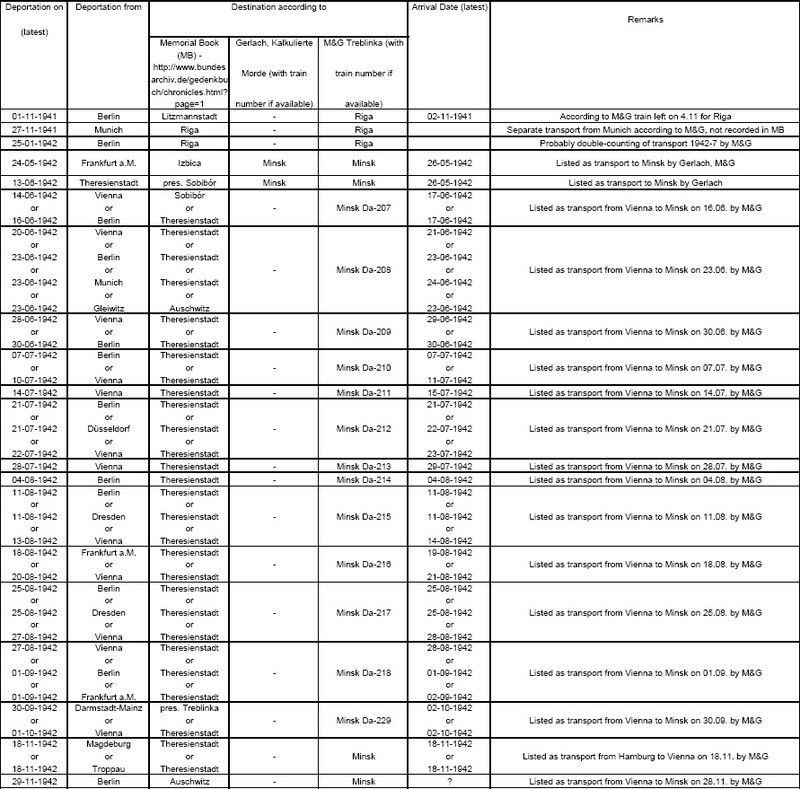 However, as can be seen in Table 1, M&G’s "more comprehensive" list (which was compiled from secondary sources rather than the authors’ own archival research, contrary to what TK’s reference might suggest) fails to mention 2 transports to Kovno, 6 transports to Riga and one transport to each Minsk and Raasiku that are mentioned in the GFA Memorial Book (MB). 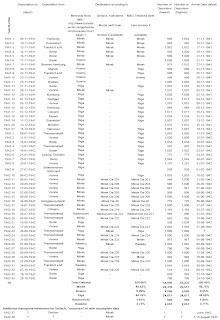 Moreover, as is visualized in Table 2 below, the transports to Minsk not mentioned by Gerlach that are listed by Mattogno & Graf (M&G) are also not included in the MB, which on the other hand mentions transports on the dates mentioned by M&G, or on nearby dates mostly from the place of origin stated by M&G (Vienna, except in one case) that went to destinations other than Minsk (usually Theresienstadt). 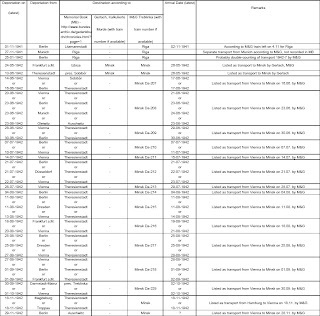 The table also shows one transport to Minsk mentioned by both M&G and Gerlach that the MB shows to have been directed to Izbica on occupied Polish territory, and a transport mentioned only by Gerlach that was possibly directed to Sobibór according to the MB. So if Lansky’s number of transports were correct, this would mean 16 to 18 transports to Minsk/Maly Trostinec in 1942 that have been identified by historians vs. 81 to 83 transports not identified so far – hardly a plausible assumption considering the research efforts made over the past decades, the documentation available for all identified transports except the two additional transports mentioned by Gerlach, and the absence of any other evidence that would corroborate Lansky’s order of magnitude. On the other hand, contemporary German evidence about the Jewish population of Minsk, the surrounding areas and the entire General District White Ruthenia at relevant times not only shows the witness to have been badly mistaken about the number of German, Austrian or Czech Jews taken to Maly Trostinec, but also cuts short all of TK’s speculations about high numbers of unknown deportees to these areas. If TK read more of Gerlach’s monumental study about the German occupation of present-day Belarus than the sections about foreign Jews deported there (which as a conscious researcher he should have, as Gerlach provides what is arguably the most detailed account available of what the Nazis did to Jews - and non-Jews - on Belarusian territory ), he cannot have missed the German historian’s detailed reconstruction of Nazi murder actions against the Jews in White Ruthenia, which is largely based on contemporary German documents. The history of these actions shall be briefly rendered hereafter, based mainly on Gerlach’s research. In every encounter with partisans in White Ruthenia, it has been established that in the former Soviet part of the district general as well as in the former Polish part the Jews together with the Polish Resistance Movement in the East and the Red Army men of Moscow are the mainstay of the partisan movement. As a result of this, and in view of the danger to the whole economy, the treatment of the Jews in White Ruthenia is a predominantly political matter which, therefore, should not be solved according to economic but political angles. During detailed consultations with the SS Brigadefuehrer Zenner and the extremely capable Chief of the SD, SS Obersturmbannfuehrer Dr. jur. 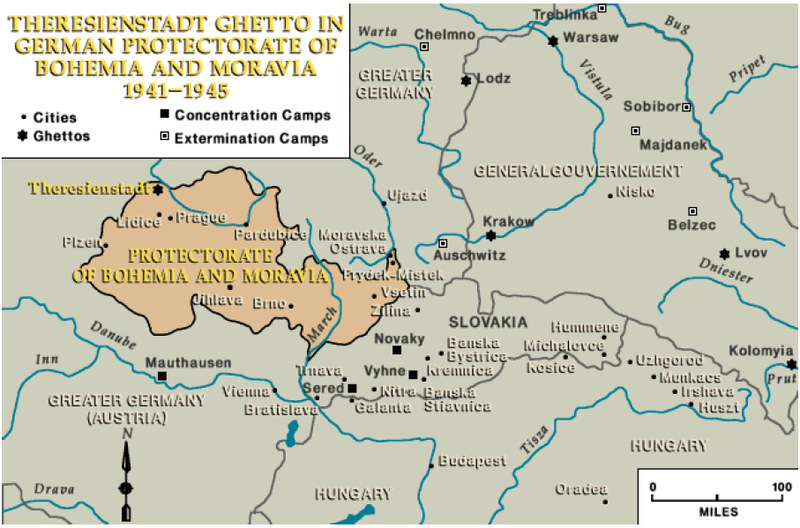 Strauch, we found that we had liquidated approximately 55,000 Jews in White Ruthenia during the last 10 weeks. In the Minsk-Land area, the Jewry was completely exterminated, without endangering the allocation of labor in any way. In the prevailing Polish Licla area, 16,000 Jews, in Slonim 8,000 Jews, etc., were liquidated. The preparations for the liquidation of the Jews in the Glebokie area were completely disrupted by the arbitrary action by the rear army area, which has already been reported to your office. In the rear army area-I was not contacted-10,000 Jews were liquidated who were scheduled for extermination by us anyway. In the city of Minsk about 10,000 Jews were liquidated on 28 and 29 July, 6,500 of whom were Russian Jews-mainly old people, women, and children-the remainder consisted of Jews unfit for work, most of whom had been sent to Minsk from Vienna, Brno, Bremen, and Berlin in November of the previous year at the Fuehrer's orders. The Slutsk area was also ridded of several thousand Jews. The same applies to Novogrudok and Vileika. Radical measures still remain to be taken for Baranovichi and Hanzevichi. In Baranovichi, about 10,000 Jews are still living in the town alone, 9,000 of whom will be liquidated next month. In the town of Minsk, 2,600 Jews from Germany have been left over. Besides, all the 6,000 Jews and Jewesses are still alive who have been working, during the action, with the units who had employed them previously. Even in the future the largest Jewish labor force will be in Minsk, since the centralization of armament industries and the burden on the railways makes this necessary for the time being. In all other areas the number of Jews utilized for labor by the SD and myself will be fixed at 800 at the outside but at 500 if possible so that after the completion of the action 8,600 Jews will remain in Minsk and approximately 7,000 in the 10 remaining territories, including the territory Minsk-Land, which is already free from Jews. The danger that the partisans will, in future, derive any important support from the Jews will then have ceased to exist. I myself and the SD would certainly much prefer that the Jewish population in the district general of White Ruthenia should be eliminated once and for all when the economic requirements of the Wehrmacht have fallen off. For the time being, the necessary requirements of the Wehrmacht who is the main employer of the Jewish population are still being considered. The clear anti-Jewish attitude of the SD and the difficult task of the units in White Ruthenia to deliver again and again new Jewish transports from the Reich to their destination, both put an undue strain on the physical and spiritual strength of men of the SD and diverts them from their real purpose, which lies in the White Ruthenian region itself. I should therefore be grateful if the Reich Commissioner could see his way to stop further Jewish transports until the partisan threat has finally been overcome. I must make 100 per-cent use of the SD against partisans and against the Polish Resistance Movement, both of which demand the use of the full strength of the SD units, which are none too strong as it is. After the conclusion of the anti-Jewish action in Minsk, Dr. Strauch, SS Lieutenant Colonel, reported to me tonight, with justifiable wrath, that without any order from the Reich Leader SS and without notification of the commissioner, a transport of 1,000 Jews has suddenly arrived from Warsaw for use in this air fleet area. I should like to ask the Reich Commissioner (who has already been advised by teletype), in his capacity as the highest authority in the Ostland, to stop such transports. The Polish Jew is, exactly like the Russian Jew, an enemy of all that is German. He represents a politically dangerous factor, the political danger of which exceeds by far his value as a specialized worker. Under no conditions must Wehrmacht agencies of the army or the Luftwaffe, be allowed to import, without the approval of the Reich Commissioner, into an area under civil administration, Jews from the General Government who might endanger the entire political work and security of the district general. I am in full agreement with the commander of the SD in White Ruthenia, that we are to liquidate every Jewish transport which has not been ordered or announced by our superior officers, so as to avoid further unrest in White Ruthenia. e) Kube strongly objected to the Wehrmacht "importing" Jewish laborers from the General Government into White Ruthenia, threatening to liquidate every such transport that had not been ordered or announced by his superiors (even though these transports can’t have amounted to much, otherwise SS Lieutenant Colonel Dr. Strauch wouldn’t have freaked out over a single transport from Warsaw, as mentioned by Kube). Unsurprisingly TK doesn’t mention this document anywhere in his "study". Disingenuous though this is, it may be less so than Mattogno & Graf’s attempt to use to their advantage a telegram that Kube sent to Lohse on the same day protesting against the arrival of "1,000 Jews from Warsaw to work at Minsk", while omitting the above-quoted document. Lohse’s above-mentioned reply to Göring at the meeting on 6.8.1942 suggests that the Jewish population of the other three districts of the RK Ostland (Lithuania, Latvia and Estonia) had also been reduced to a small remainder at the same time. I might thus stop here, but I prefer to take further advantage of this nice opportunity kindly offered by TK. Kube, who received reports about the extermination of the Jews from his Regional Commissioners, had earlier expressed the following praise in a recommendation letter for SS and Police Commander Zenner: "If during your time of service especially the Jewry hostile to us could be destroyed in its tens of thousands, this is also your merit" ("Wenn während Ihrer Amtszeit besonders das uns feindliche Judentum zu 10000den vernichtet werden konnte, dann ist das auch Ihr Verdienst."). On 27 August 1942 Head Commissar Friedrich Fenz gave the number of Jews killed in the Baranovichi region since the start of civilian administration in 1941 as 95,000, adding that another 6,000 had gone underground and fled to the woods. In April 1943 Security Police Commander Strauch stated the following about the Jews: "I think we can nevertheless be calm, because there used to be about 150 000 and now already 130 000 have disappeared." ("Ich glaube, wir können trotzdem beruhigt sein, denn vorhanden waren schätzungsweise 150 000 und es sind nun schon 130 000 verschwunden." In January 1942 the number of Jews in the General District had been estimated first at 139,000, then at 128,000. In response to a request from the Eastern Ministry (Reichsministerium für die besetzten Ostgebiete - Reich Ministry for the Occupied Eastern Territories) Kube on 23 November 1942 gave a number of 30,000 remaining Jews. On this date he had a conversation with Bach-Zelewski, head of anti-partisan units whose competence now included White Ruthenia, about the extermination of the Jews. In April 1943 Strauch mentioned that 22,000 Jews were still alive; on the same occasion v. Gottberg informed that his units had killed 11,000 since November. In Minsk about 12,000 Jews were still alive at the end of 1942. On 21 June 1943 Himmler ordered that until 1 August all remaining ghettos in the RK Ostland were to be dissolved, the (working) Jews collected in concentration camps and all "unnecessary" inhabitants of the Jewish ghettos killed. At that time about 16,000 Jews were still alive in the General District White Ruthenia, thereof 11,776 workers. The Glebokie ghetto with 2-3,000 remaining inhabitants was destroyed on 20 August in the course of anti-partisan operation "Hermann"; as the Jews knew what awaited them and put up a fight, heavy weapons were used and the ghetto was burned down. Between 17 and 19 September 1943 it was the turn of the Lida ghetto’s 4,000 Jews, who were taken to Majdanek and Sobibór in two transports. 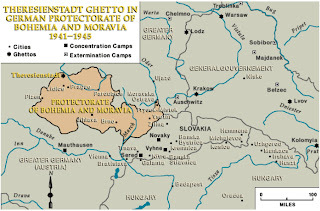 The liquidation of the Minsk ghetto also began in September 1943. Six deportation transports took at least 5,500 Jews, but probably as many as 7-8,000 including 1,000 from labor camps at Smolensk, Mogilew and Bobruisk, to Majdanek, Sobibór and Auschwitz-Birkenau, where most of the deportees were murdered. The remaining inhabitants of the "German" ghetto were mostly killed during or shortly after that ghetto’s liquidation on 14 September. Between 21 and 23 October 1943 the Minsk ghetto vanished completely and its inhabitants were mostly shot or killed in gas vans, together with most inmates of the Trostinec camp. After the ghetto’s liquidation there were about 500 Jews left in Minsk (including some German Jews), plus several hundred Jews in labor camps in the Wilejka and Baranovichi regions. In 1944 these survivors were deported to camps in Poland, mostly Auschwitz, or shot during the German retreat. "According to my estimate there were 1200 to 1300 Jews in the camp. This figure remained unchanged, the fresh supply [of manpower] was taken from camps, from Theresienstadt and Auschwitz and probably also from other ones. […] Transport after transport arrived. Often we never even heard where they came from, since it frequently happened that all [of the deportees] were immediately liquidated." Independently of TK’s having quoted Grünberg’s statement out of context, his argument is much ado about nothing. 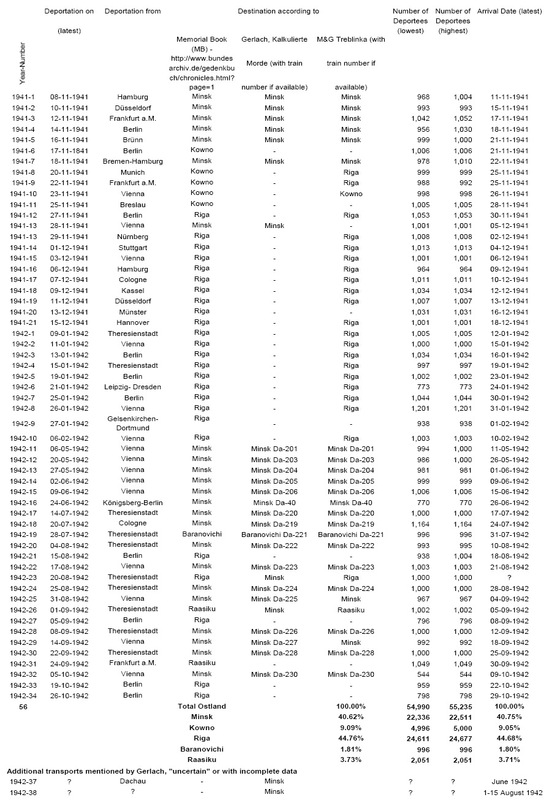 The witness might have heard about the Auschwitz and Theresienstadt camps and that transports from the latter camp had gone to Maly Trostinec prior to his arrival (there were eight such transports between 14.07. and 22.09.1942, see Table 1), and he may have assumed that subsequent transports, which actually came from areas less far away, had also come from Auschwitz and Theresienstadt among other places. As he often never even heard where arrivals had come from, his assumption may have been just an educated guess, and as concerns Auschwitz even some embellishment (due to Auschwitz being such a "famous" place) is not out of the question. It is also quite possible that Grünberg was referring to the Trostinec camp’s entire operational period and not only to his own period of stay, as TK himself considers possible regarding the at least 45,000 people "allegedly" (TK, again displaying his double standards) killed at Trostinec according to Grünberg . In the absence of corroborating evidence Grünberg’s above-quoted statement must thus be considered at best a feeble indication of transports from the places the witness mentions. Yet TK makes a big fuss about this statement and even calls Grünberg’s vague reference to Auschwitz "crucial" («here we have a witness who explicitly states, based on his own experience, that transports arrived in the occupied eastern territories from one of the "extermination camps"»), apparently forgetting that Auschwitz-Birkenau was also a concentration camp besides an extermination camp and it is theoretically possible that registered inmates from that camp were shipped as laborers to the east at one time or the other. Even if Grünberg had been accurately referring to transports arriving from Auschwitz-Birkenau and Theresienstadt during his time at Maly Trostinec, TK would still have to explain why this would make it likely that such transports passed Treblinka extermination camp, which didn’t even necessarily lie close to the route such transports would take, for transports from Theresienstadt (north of Prague, see Image 4) didn’t have to go via Warsaw to reach Minsk (as can be seen in the map of main railway lines in Eastern Europe at the time, Image 5). Even for trains going from Warsaw to Minsk via Bialystok, a stop at the Treblinka death camp would have been a rather pointless and time-consuming detour, as the map in Image 6 shows. The logical place to install a transit camp for such transports, if such had been intended, would have been Malkinia. White Ruthenia is again mentioned by TK as he presents the account of Yehuda Lerner, a survivor of Sobibór (whose accounts of what he witnessed in that extermination camp are of course untrustworthy, in TK’s book). Lerner had been born in Warsaw, and in July 1942 he had been taken from there with other Jewish forced laborers to a camp near Smolensk and eventually ended up in Minsk (from where he was later transported to Sobibór), while his father, mother and brother were separated from him at the Warsaw Umschlagplatz and deported to another destination – obviously Treblinka –, from which they never came back (TK quotes this part of Lerner’s account without comment, presumably expecting his readers to assume, as he does, that Lerner was mistaken or dishonest about losing his entire family but accurate as concerns the part supposed to suit the "Revisionist" stance, i.e. his own deportation to the occupied Soviet territories). The largest of these deportations to Belorussia were probably those of Polish Jews. These were also labor force. Thus the SS and Police enterprises and agencies in so-called "Central Russia", i.e. primarily Eastern Belarus, were to concentrate on two cities: Mogilev and Bobruisk. In Mogilev there was the already described forced labor camp of the High Commander of SS and Police, but in Bobruisk in the spring of 1942 there was labor lacking for the planned construction of the planned huge base of the Waffen-SS. The head of logistics of Waffen SS and Police Central Russia, SS-Standartenführer Georg Martin, had the idea of building a concentration camp and to bring Jews from Warsaw. Thus on 30 May 1942 960 Jewish men, who on the previous day had partially followed an appeal, partially been detained in roundups in the Ghetto, were transported to Bobruisk. On 28 July another train with Warsaw Jews reached Bobruisk; a part of the Jews were sent to Smolensk. In Bobruisk the Jews also had to do work for the Wehrmacht. The return to Lublin in September 1943 only 91 men out of the 1,500 deportees lived to see, while all others had fallen victim to the constant selections, the work, the hunger and the terrible treatment. Furthermore there were possibly one or several transports whose inmates were shot immediately upon arrival. Among these there was possibly at least one transport with German Jews. In this context some depositions, according to which in 1942/43 there were large shootings of Jews at or near Bobruisk up to a number of 12,000 to 15,000 victims, are of interest, but cannot be verified here. This shows how much these events are still unknown to us. Polish Jews were also taken by train to Minsk. On 31.7.1942 1,000 Warsaw Jews got there, who were to be used as labor for the air force in the Minsk area. Kube threatened to immediately destroy them and all further unannounced transports. It is unclear, however, whether this happened. As a matter of fact many Polish Jews were imprisoned at Trostinec, who apparently were under the Organization Todt and of whom about 250 were handed to the SS construction management in Smolensk. Also in the Minsk ghetto there are said to have been Polish Jews. What is unclear is how many trains with Polish Jews got to Minsk. Gerlach’s research finds suggest the deportation of several thousand Polish Jews as forced laborers to White Ruthenia, but TK is understandably reluctant to use them (transports whose inmates were shot immediately upon arrival are obviously not to his liking, and neither is the fact that almost all deportees to Bobruisk mentioned by Gerlach perished there, not to mention Gerlach’s reference to the Warsaw Jews arriving at Minsk on 31.7.1942, which leads to Kube’s highly inconvenient message to Lohse quoted above). Accordingly TK refers to Gerlach’s finds very selectively, arguing that "according to Gerlach the 28 July Bobruisk transport together with a previous transport of 961 Jews from Warsaw to Bobruisk on 30 May 1942 consisted of in all some 1,500 people, so that the latter convoy would have contained approximately 540 Jews" whereas Lerner stated «that the deportees of his transport numbered "some thousands"». TK doesn’t reveal whether this contradiction in numbers (which would at worst mean an overestimate such as eyewitnesses are prone to make), plus Lerner’s supposedly not having mentioned a stopover in Bobruisk, is meant to call in question the quality of Gerlach’s research or the witness’s reliability. The latter is suggested by TK’s lame remark that "we have only Lerner's personal assurance that the train did not stop anywhere on the way from Warsaw to Smolensk—for example in Treblinka". If so, his "witness said nothing about a stopover in Treblinka but witness may have lied" - argument highlights the dire lack of evidentiary support that TK (and "Revisionism" in general) desperately struggles with. In the first week of deportations from Warsaw there turned up greeting cards in the Ghetto by deportees from Bialystok, Brest, Kossow (20 km from Bronnaja Gora), Malkinia, Pinsk and Smolensk (Arad 1987, p. 244). The problem with these cards, which were meant to mislead and calm down the ghetto population, is that one part was feigned, another not. Deportations to Smolensk and Bobruisk did in fact take place (see chapter 7.5b), while the cards from Malkinia must have been written on the way to Treblinka. Especially these people [Jews deported from the Netherlands] were furthermore cynically used as tools to uphold the myth of "resettlement" and of the innocuousness of the camps in the Lublin district among relatives in their homeland. After the speech held by the "doctor", the arrivals were allowed to write post cards to their relatives, of course under supervision, and they were told what to write. The senders sometimes had to write "Wlodawa labor camp" as "postal address". As procedures in the three camps of Aktion Reinhard(t) were very similar, it stands to reason that such letters are likely to have originated in Treblinka as well at some time or other, even if there are no eyewitness testimonies mentioning them. "That Jews were brought to Belarus not only from the Great German Reich and the Protectorate of Bohemia-Moravia, but also from other countries has until now  been almost overlooked. Only some of the transports in question can be traced in detail, and often we know of them only from isolated witness statements, which means that they cannot be confirmed with certainty. Thus after the war, witnesses of a certain authority, for example the former Gebietskommissar of Borissow, [Karl] Bauer; Karl Buchner, a member of KdS Minsk Abteilung IVb specially responsible for gas vans; a surviving German Jew [identified only as "W.M. "], and a member of the Arbeitsamt Minsk ["H.H. "], stated that French Jews had arrived in Minsk. […] The situation is similar when it comes to possible deportations of Dutch Jews, who are said to have worked in, among other places, the weapons workshop in Minsk." TK must have missed Gerlach’s caveats that I highlighted, or then he failed to realize that they refer to what a historian should not do and what TK has been doing throughout his "study", which is to jump to conclusions (moreover desired ones) based on isolated witness statements not confirmed by or at odds with their evidentiary context. Gerlach’s "almost overlooked" remark feeds one of TK’s conspiracy theories, as he postulates that the reason why the transports of French and Dutch Jews to Belarus have hitherto not or barely been take note of by historians is "of course that they do not fit with the official historiography on the deportations of these groups of Jews". Of course there’s hardly such a thing "official historiography" outside TK’s cloud-cuckoo-land, and the reason for French and Dutch Jews having been "almost overlooked" that common sense suggests is the uncertainty of related evidence and the comparative insignificance of their numbers that such uncertain evidence suggests. Gerlach, according to TK, is "unaware—or pretends to be unaware—of the implications of the testimonies he refers to, and he completely refrains from discussing them in a broader context". One might argue that Gerlach should – if only in order to forestall such imbecilic remarks – have spent a sentence on pointing out that the accuracy of reports about the presence of French and Dutch Jews in Nazi-occupied Belarus would imply that there were so far unidentified small transports of French and Dutch concentration camp inmates to Belarus, which is what the evidentiary context (especially the documentary evidence about the destinations of transports from these countries) would call for assuming in such case. As to the silly "completely refrains" – remark, perhaps TK can explain in what "broader context" Gerlach should have addressed these reported French and Dutch deportees within the scope of a study about German occupation and extermination policies in Belarus. After castigating Gerlach with "Revisionist" rhetoric, TK has the historian write that "it is a commonly held notion in Belarus that Jews from France and other Western European countries were sent to Minsk". Following this slight misrepresentation, TK refers to Belarusian historian Marat Botvinnik, who holds that there were also Jews from Holland and Belgium in the Minsk Sonderghetto for foreign Jews and that this ghetto held up to 24,000 Jews – albeit without a source reference (as TK acknowledges) and also (as he fails to mention) at odds with the aforementioned documentary evidence, according to which the "German" ghetto held less than 7,000 deportees who had arrived in late 1941. Of these only 2,600 were left after the massacres of late July 1942 (as mentioned in Kube’s letter to Lohse of 31.7.1942). These were murdered in smaller operations in early 1943 or during the ghetto liquidation in September of that year, or deported to camps in Poland that only few survived. Further witnesses who thought they saw or heard about Jews that according to TK do not fit "exterminationist historiography" in White Ruthenia include Inge Stolten (who "heard of Dutch Jews" in Minsk) and Tsetsilia Mikhaylovna Shapiro (who escaped from Minsk in early November 1942 and "stated that French Jews had been present in this city"). However, most of the testimonies presented by TK refer to Lithuania and Latvia, which will be addressed in part 2 of this article. Evidence for the Presence of “Gassed” Jews in the Occupied Eastern Territories, Part 1 (hereinafter "Kues Evidence 1"); Evidence for the Presence of "Gassed" Jews in the Occupied Eastern Territories, Part 2. Kues Evidence 1 mentions ca. 99,900 "allegedly perished" and 5,100 returned deportees from the Netherlands, 25,000 deportees from Belgium, of which "fewer than 1,500 returned after the war", 75,000 deportees from France to Auschwitz, Majdanek, Sobibór and Kaunas (Kovno). According to German historian Hans-Heinrich Nolte (Kleine Geschichte Rußlands, 2008 Reclam, Ditzingen, p. 257), there were 5.1 million Jews on Soviet territory on 22 June 1941. Of these 3.1 million had already been Soviet citizens before September 1939, 1.8 were from the territories annexed by the Soviet Union in 1939/40 (Eastern Poland, the Baltic Countries, parts of Romania) and 200,000 had fled across the Bug from German-occupied Poland. About 2.7 million Jews on Soviet territory fell under German rule after the 1941 invasion; of these about 100,000 survived (20,000 as partisans, 80,000 in German concentration camps) and 2.6 million were murdered. If only 10 % of the survivors left recorded testimonies at one time or the other, TK’s testimonies are but a tiny fraction of the pertinent body of Jewish eyewitness testimonies (in addition to which there are many testimonies from the German occupiers and non-Jewish local inhabitants). Even considering only testimonies from the specific parts of the occupied Soviet territories where TK tries to place his "transited" Jews, the proportion of witnesses who provided information that TK considers to support his conjectures (besides much other information that doesn’t) should be comparatively insignificant. Gerhard Hirschfeld’s article about the Netherlands in Wolfgang Benz et al, Dimensionen des Völkermords (1996 Deutscher Taschenbuch Verlag GmbH & Co. KG, Munich), page 151, mentions 3,540 Dutch deportees of this so-called Kosel group in forced labor camps later declared sub-camps of Auschwitz III (Monowitz) and Gross-Rosen, of which 181 survived. Listed in the chronology of deportations from the Netherlands published by the German Federal Archives as part of the memorial book Gedenkbuch des Bundesarchivs für die Opfer der nationalsozialistischen Judenverfolgung in Deutschland (1933-1945) (hereinafter "GFA Memorial Book"). About 200,000 Jews fled across the Bug from German-occupied Poland after the 1939 invasion (Nolte, as note 4). Such transports are mentioned in Christian Gerlach, Kalkulierte Morde. Die deutsche Wirtschafts- und Vernichtungspolitik in Weissrussland 1941 bis 1944, Hamburg, 1999 (hereinafter "Gerlach, KM"), pp. 761-764. Map of Galicia District in 1943, copied from the cover inside of Thomas Sandkühler, Endlösung in Galizien, 1996 Verlag J.H.W. Dietz Nachfolger GmbH, Bonn. At least 2,497,000 people who disappeared behind the gates of the Chełmno, Bełżec, Sobibór, Treblinka, Lublin-Majdanek and Auschwitz-Birkenau, minus about half a million Jews who perished at Auschwitz-Birkenau in 1944. «Evidence for the Presence of "Gassed" Jews in the Occupied Eastern Territories», parts (1), (2), (3,1), (3,2), (3,3). Gerlach, KM, pp. 159 ff. ; Wikipedia page Reichskommissariat Ostland. The map is from this page. 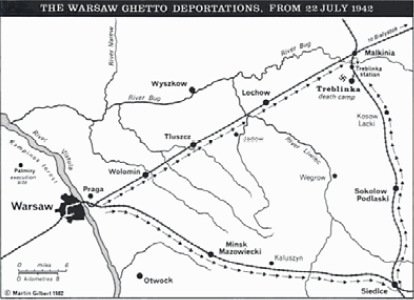 Having read Gerlach, TK is obviously aware that until July 1942 Jewish deportation trains arrived at the Minsk freight station, from where the deportees were taken to Maly Trostinec. Only from 10 August 1942 on the trains were redirected from Minsk to Trostinec via the Kolodischtschi station (Gerlach, KM p. 756, expressly cited by TK regarding the latter procedure). Gerlach, KM pp. 736 ff., 768 ff. Gerlach estimates the victims of Maly Trostinec at about 40-60,000 and breaks down the lower figure into ca. 5,000 Jews from the Minsk ghetto killed in each July 1942 and the autumn of 1943, 20,000 Jews deported from Central Europe in 1942, 3,000 (non-Jewish) so-called bandit suspects killed in gas vans in February 1943 and 6,500 inmates of camps and prisons massacred during the German retreat at the end of August 1944 (p. 770, fn. 1469). Other extermination sites in the surroundings of Minsk include "the graves of Glinishchi in the north-west with about 66,000 and at Urechye with an estimated 12,500 (officially 30 000) destroyed prisoners of war", "the pit of Drosdy (10,000 dead civilians)" and "the graves of Petrashkevichi (14,000 to 20,000 dead civilians; officially 25,000 according to one source, 54,000 according to another) and at Tuchinka, at the Jewish cemetery, in the cultural park etc." (fn. 1472 on pp. 770/771, my translation). The "official" figures are from Soviet criminal investigations of the killing sites and mass graves, whereas Gerlach’s own lower estimates "result partially – not always – insofar as the measurements of the mass graves are known". Soviet documentation of the remaining physical evidence at the Maly Trostinec includes graphic photographs of carbonized bodies (not recommended for sensitive viewers) that are shown in the webpage Maly Trostinec and in the USHMM query Maly Trostinets. See also the critique of Kues Evidence 1, part (3,3). The list is based on the chronology of deportations from the German Reich included in the GFA Memorial Book, and as concerns transports to Minsk also on the lists provided by Gerlach (KM pp. 752, 758-59). The transport on 20.08.1942 (1942-23) went to Riga according to the Memorial Book, whereas Gerlach mentioned Minsk. The destination of the transport on 01.09.1942 (1942-26) was Raasiku according to the Memorial Book, Minsk according to Gerlach. Two further transports with incomplete data mentioned by Gerlach are not included on the Memorial Book. An additional column shows which of the transports listed in the GFA Memorial Book’s chronology and by Gerlach are mentioned by Mattogno & Graf in Treblinka – Extermination Camp or Transit Camp (hereinafter "M&G, Treblinka"), pp. 200/201. Gerlach, KM, pp. 751 ff. According to Gerlach the number of deportees was 6,959. My edition of Kalkulierte Morde has 1232 pages. The total number of people in Belarus who fell victim to the occupiers’ violence outside the scope of combat actions, i.e. were murdered in one way or the other, is estimated by Gerlach (Kalkulierte Morde, p. 1158) at 1.6 to 1.7 million out of about nine million people who fell under German rule on Belarusian territory, thereof about 700,000 prisoners of war, 500,000 to 550,000 Jews, 345,000 victims of so-called anti-partisan fighting and about 100,000 victims of other population groups (Gypsies, members of urban resistance groups, so called "Ostmenschen", i.e. immigrants from Russian territories, members of the local Polish intelligentsia, physically or mentally handicapped people and civilians held in detention camps near the frontline to cover the German retreat in 1943/44). See also the blog One might think that …. Described in Gerlach, KM pp. 609-628, see also the blog That's why it is denial, not revisionism. Part IX (3): «The reports of the Einsatzgruppen …. Gerlach, KM, p. 706, referring to an excerpt from the meeting’s minutes in IMT, Vol. XXXIX, p. 402. Nuremberg document 3428-PS, IMT Vol. XXXII, pp. 279-282, translation in NMT Vol. IV, pp. 191-193. See the critique of Kues Evidence 1, (3,3). See Jonathan Harrison, Mattogno and Graf Screwed By Their Own Source. Gerlach, KM p. 706, referring to the report GebK Glebokie, Betr. Judenaktion v. 1.7.1942 in ZStA Minsk (Central State Archives, Minsk) 370-I-483, fl. 15, and interrogation of M.R. (head of the Regional District’s secret registration office) on 11.4.1968, ZStL (Central Office of Federal Judicial Administrations for the Investigation of NS-Crimes, Ludwigsburg, Germany) II 202 AR-Z 185/67, fl. 76f. Ibid, referring to Kube’s recommendation letter for Zenner dd. 17.7.1942, LHA (Main Federal State Archive) Koblenz 584, I, Nr. 3552, after fl. 118 (Berlin Documentation Center file on Carl Zenner). Ibid, referring to Fenz’ communication to the General District White Ruthenia dd. 27.8.1942, Nuremberg Document NG-1315. Ibid, referring to a presentation by Strauch on 10.4.1943, IfZ (Institute for Contemporary History, Munich) Fb 85/I, fl. 165. Ibid, referring to EM (Operational Situation Report) 155 dd. 14.1.1942, BA-MA (German Federal Archives – Military Archives) SF-01/28935, fl. 3611 and Security Police Commander Minsk report of January 1942, IfZ Fb 104/2. Ibid, referring to Reitlinger, Hilberg and other authors and to Bach-Zelewski’s diary entry of 23.11.1942 (BA R 20/45b, fl 61) in which Bach Zelewski claimed (falsely, according to Gerlach) that he had tried to convince Kube to take a milder approach toward the Jews. Gerlach further refers to a situation report from the General District White Ruthenia administration department dd. 15.10.1942 (BA R 93/3, fl. 42) whereby at the end of September there were 17,770 Jewish laborers in the General District, thereof 9,270 women and 8,500 men. Ibid, p. 707, referring to a communication from the General District White Ruthenia dd. 25.11.1942 to the Regional Districts (ZStA Minsk 391-I-39, fl. 4) and to presentations by Strauch and v. Gottberg on 10.4.1942 (IfZ Fb 85/I, fl. 148 and 165). Ibid. Gerlach breaks the figure down into 2,600 German Jews according to Kube’s above-quoted letter to Lohse dd. 31.7.1942 and 9,472 Belarusian Jews according to the Minsk city commissioner’s situation report dd. 30.9.1942, ZStA Minsk 370-I-473, fl. 21. Ibid, p. 736, referring to Himmler’s letter to the Head of SS and Police Ostland and to Pohl (head of the SS-Wirtschafts-Verwaltungshauptamt) dd. 21.6.1943 (typescript), BA D-H ZR 945, A.2, fl. 18. Ibid. The number of workers (subdivided into 5,273 men and 6,503 women) as of 25.7.1943 follows from a special report about labor deployment dd. 26.8.1943 by the Minsk armament industry command (Wehrwirtschaftskomando), BA-MA (BArchP)F 42899 fl. 53. The total number is mentioned in a memorandum dd. 20.08.1943 about the Eastern Ministry’s meeting on 13.7.1943, Nuremberg Document NO-1831. A partial translation of this document is available in NMT Vol. XIII, pp. 1016 to 1022. Ibid, pp. 739 ff. with numerous source references. Five transports, comprising about 8,000 Czech, German and Austrian Jews, were sent to Treblinka from the Theresienstadt ghetto between October 5 and October 25, 1942. The first two transports departed on October 5 and 8, and carried 1,000 Jews each. The last three, each of 2,000 Jews, departed on October 15, 19 and 22. The trip to Treblinka took two days. Yitzhak Arad, Belzec, Sobibor, Treblinka. The Operation Reinhard Death Camps, Indiana University Press, Bloomington and Indianapolis 1987 (hereinafter "Arad, Reinhard"), pp. 141 f. TK points out that "at least one of the five trains—the second transport departing on 8 October (Bu)—reached Treblinka, as one of the Jews on board, Richard Glazar, was picked out to work in the camp and later survived the Treblinka prisoner revolt to became a Holocaust witness". Something TK doesn’t tell his readers, as pointed out by Jonathan Harrison. I get suspicious when I see omission marks in a TK quote, ever since I came across TK’s trick regarding the Sobibór water table, mentioned in the blog An investigation of Treblinka by a forensic archaeologist .... Here the […] separates two parts of the Grünberg’s account quite unrelated to each other, as can be seen in the online excerpt quoted by Christoph Lind that Jonathan (see previous note) refers to. The "Transport after transport" – part follows a description of how the luggage of arriving transports was processed, and its full context is the following (my translation, partially using TK’s): "Transport after transport arrived. Often we never even heard where they came from, since it frequently happened that all were immediately liquidated. There were also Russian prisoners of war there. At the beginning the people were shot and buried dressed, like they came. Later the corpses were naked. I then also saw my wife’s coat and knew what had happened." The distinction between what happened at the beginning and later suggests that Grünberg was referring to the camp’s entire operational period (and not only to the period of his stay as an inmate), drawing on what he had learned from other witnesses as concerns times prior to his arrival. As pointed out in Jonathan’s aforementioned blog, TK is at odds in his conjectures with his associates Mattogno & Graf, who in their book about Treblinka considered that "direct transports to Minsk arrived first in Warsaw and ran over the Siedlce-Czeremcha-Wolkowusk line, so that they were traveling past Treblinka at a distance of approximately 80 km (Siedlce railway station)" (M&G, Treblinka, p. 245). 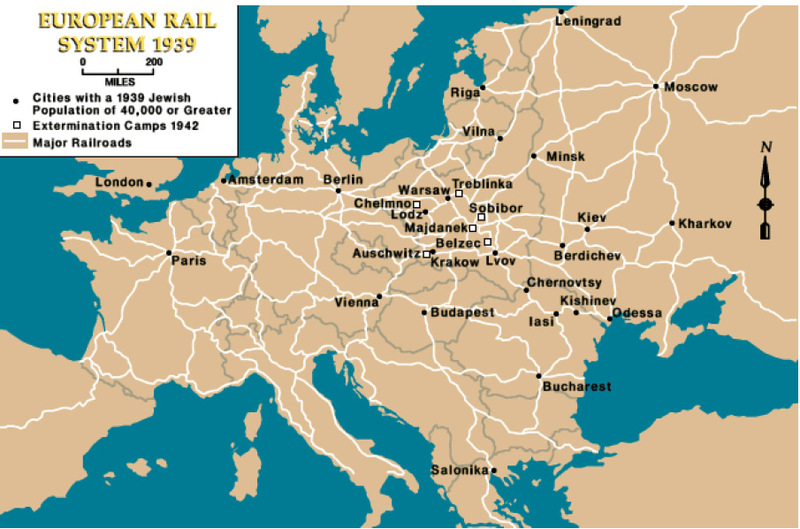 The "Revisionist" geniuses lamely argue that it would have made no sense to send transports further east without passing Treblinka extermination camp when that camp was already in operation – as if mass murder made any sense at all, destinations had not been determined by factors such as transport availabilities, the Nazi administration had been a monolithic machine and such "coulda-shoulda-woulda" arguments had any relevance in the face of evidence. According to "a brief, undated testimony (written sometime between 1951 and 1978)" quoted by TK after Miriam Novitch, Sobibor. Martyrdom and Revolt, Holocaust Library, New York 1980, p. 111. In the Transcript of the Shoah Interview with Yehuda Lerner on the USHMM site, p. 2, Lerner mentioned that the people who were with him at the Umschlagplatz were "my mother, my father, my brother and my sister, and I had another brother but he was already in a camp". KM pp. 762-63, my translation. Actually it is not clear from TK’s source (as note 45) whether Lerner meant to say that the "some thousands, of young people" selected as able to work were all on the transport that took Lerner to the occupied eastern territories. See note 61 of the blog Mattogno on Chełmno Cremation (Part 1). In the "a brief, undated testimony" mentioned in note 45. Gerlach refers to pp. 133-136 of Novitch, Martyre et Revolte, Paris 1978, suggesting the possibility that Novitch also published a longer account of Lerner’s conveniently omitted by TK. Gutman, as quoted by TK, plausibly reasons that such letters were from deportees compelled to write them by the Germans as a means to mislead the remaining ghetto inhabitants into complying with deportation orders, or from Jews who managed to escape from transports to Treblinka, where reports about such letters where not mere rumors deliberately circulated by the Germans or such as are bound to come into being "in a community starved for hope and trying to block out the horrible truth". Gerlach, KM, p. 723 fn. 1195 (my translation and emphases). Ilana Safran and Leon Feldhendler, see Arad, Reinhard, pp. 148-49. The practice of inducing arriving deportees into writing reassuring letters or postcards was also mentioned in notes left by one of the last inmates of Chełmno extermination camp (quoted in Łucja Pawlicka-Nowak (ed. ), Chełmno Witnesses Speak, Konin 2004, pp. 69f. ; see also the webpage The Testimonies of the Last Prisoners in the Death Camp Chelmno). Judgment Landgericht Hagen v. 20.12.1966, 11 Ks 1/62, published in Justiz und NS-Verbrechen Band XXV, Lfd. Nr 642, partial translation. What Gerlach actually writes is that there is presently  a tendency towards the notion that there were French Jews in Belarus, according to an oral communication from A.D. Krasnoperko on 16.10.1993 (KM, p. 761, fn. 1413). Here is some further information showing why Minsk is a red herring. In the meeting held on 13.7.43 (NO-1831), Rosenberg stated that 4,500 persons had been killed by partisans in GK Shitomir (part of RK Ukraine) in the past year. Berger stated that anti-partisan operations would be intensified in White Ruthenia and Ukraine. Sauckel made a suggestion “to declare the partisan areas theaters of operations and to evacuate them”. Kube then requested the evacuation of White Ruthenia’s remaining 16,000 Jews. Meyer responded that the whole of the Ostland had 72,000 Jews, of which 50,000 would be concentrated into camps and 22,000 would be resettled. There was clearly no option to keep these Jews in the Ostland, so it must be concluded that Himmler’s intention was to totally clear White Ruthenia of Jews by sending them westwards to the General Government. This documentation therefore converges with the evidence that Minsk Jews were sent to Sobibor in September 1943. The Jewish population of Minsk therefore remained static from 31.7.42 until the 13.7.43 meeting, as the latter reported 8,500 Jews remaining in Minsk. Kues presents no testimony or documentation concerning Minsk that refutes the extermination narrative that was established by the end of Berger’s trial at Nuremberg. Approximately in the middle of 1943, the Security Police arrived in Lida. . . . All the Jews were then subordinated to the Security Police. One day, these Jews from the ghetto—men, women, and children, were loaded onto freight cars and under the direction of HaupttruppFührer Bache from Organization Todt they were transferred to Sobibor. The next day I received an order from the head of my department, the architect Hans W., to transfer our Jews to Lublin for a working mission. The Jews were loaded on the train that day, sixty people to a freight car. I was the commander of the transport, and I had at my disposal a police sergeant and nineteen Polish policemen. . . .
On the wall of this barrack was a big plan of the camp. I could see on it that the 1,400 Jews that Bache had brought the day before could not possibly be accommodated in the existing barracks. In reference to my question to the camp commander, where can he accommodate the Jews I had brought, he told me that of the 1,400 Jews of yesterday’s transport, nobody remained." This quote appears partially in MKG's Sobibor but the key parts that reveal the fate of the Sobibor jews are omitted. "As he often never even heard where arrivals had come from, his assumption may have been just an educated guess, and as concerns Auschwitz even some embellishment (due to Auschwitz being such a "famous" place) is not out of the question." This is at odds with Harrison's interpretation, as he claims that it is possible that he was only referring to earlier transports. This is the problem with Gruneberg's statement: it is inherently vague as evidenced by the differing interpretations given by Kues, Harrison, and you. In other words, Gruenberg's statement is not evidence for the revisionist 'transit' thesis, because several alternative evaluations of it can be made, which the deniers haven't been able to rule out. Essentially all sources cited in favour of 'resettlement' are "inherently vague" and therefore are not reliable sources to support the thesis. They are also infinitely more vague, and significantly fewer in number, than testimonies reporting extermination.